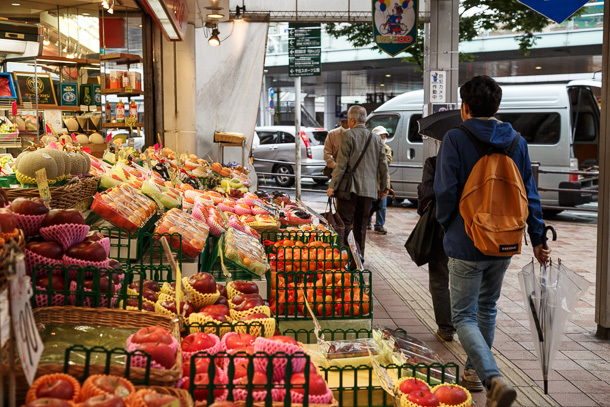 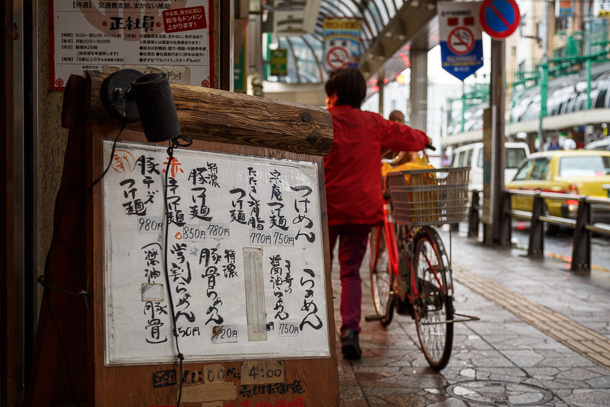 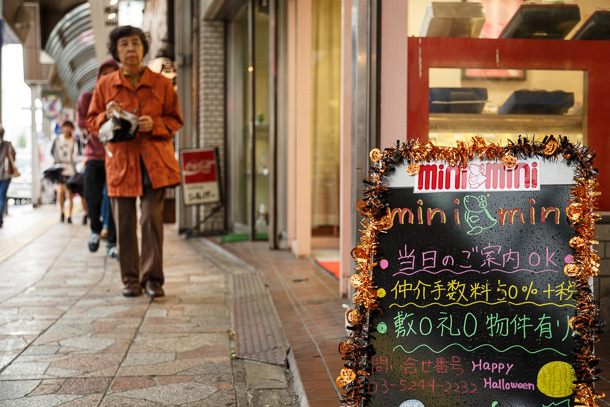 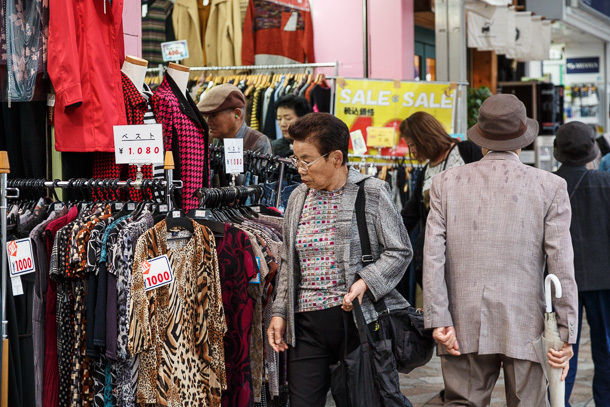 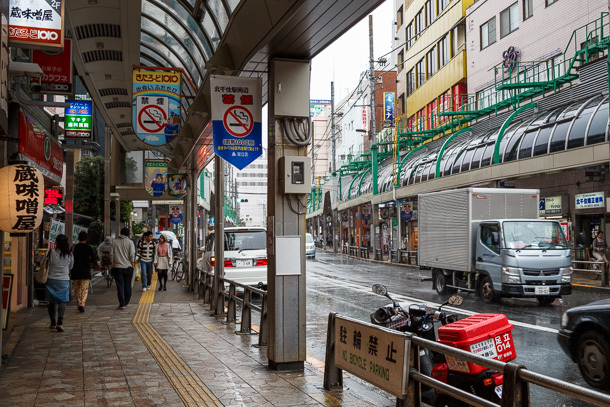 Kitasenju (北千住) is an interesting cluster of shōtengai, narrow high-texture streets and, more recently, university campuses orbiting the hub train station of the same name in Adachi Ward. 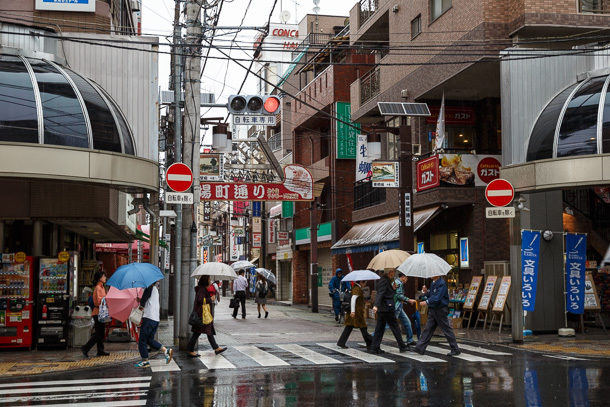 There is much to see and my original walk plan had been to spend at least half a day exploring. 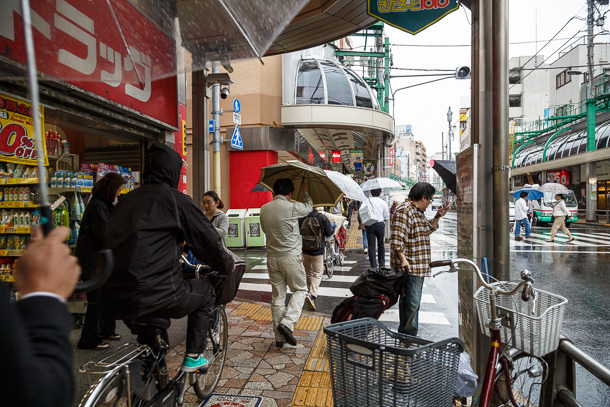 When rain moved in, rather than scrap the walk, I decided to turn it into a challenge. 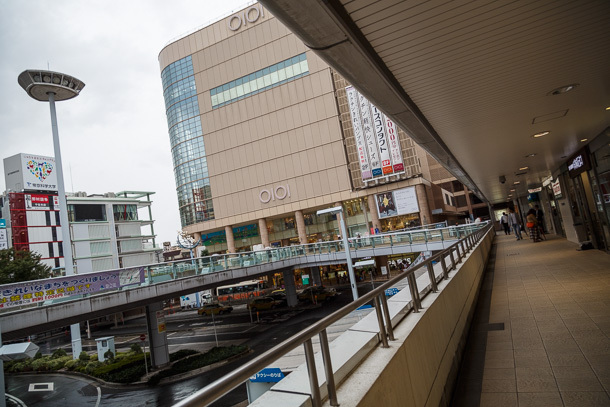 The elevated walkways around the station and main shōtengai that functions as a backbone leading out on the west side provide almost continuous cover. 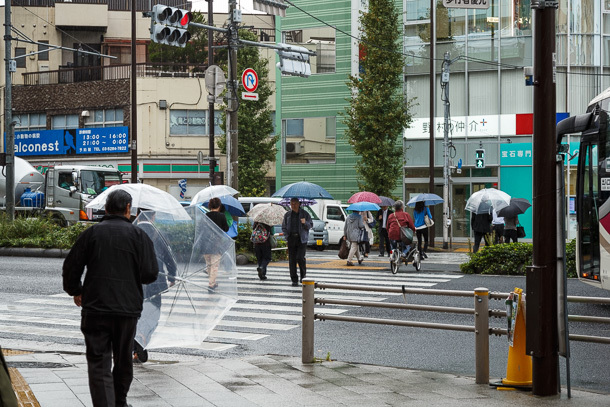 I thought I would see as much as I could within this constraint and try not to get too wet. 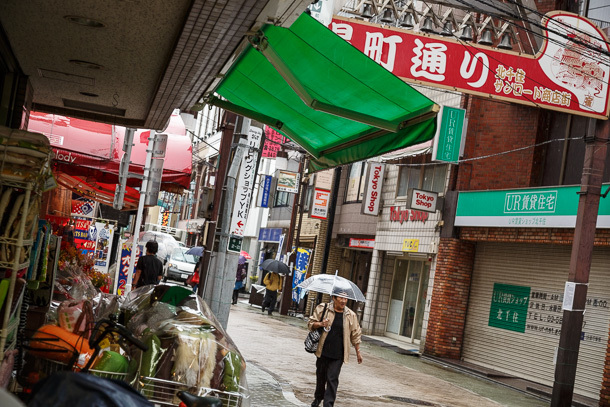 Most of the really interesting areas are the smaller shōtengai and alleys behind the main roads, which were mostly hidden from my vantage points. 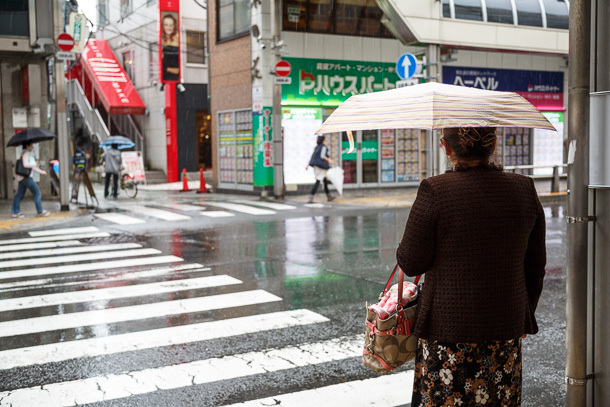 Think of this post as brief introduction, with a promise to revisit at some point with better weather. 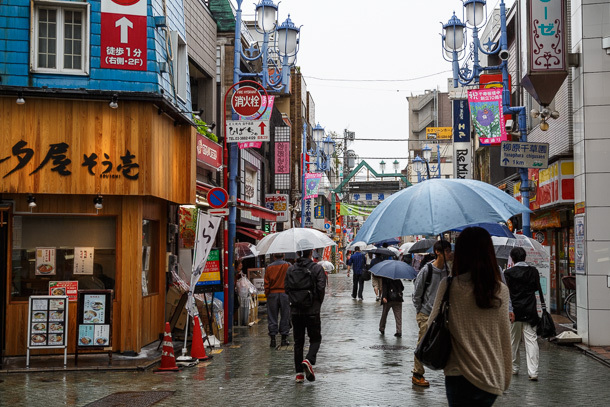 For now, I’ve mapped the large shōtengai, but there are also smaller ones and narrow streets that, while not formal shōtengai, are filled with little shops and places to eat and drink. 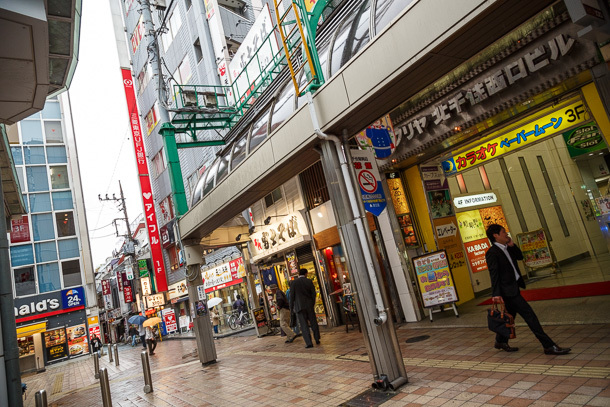 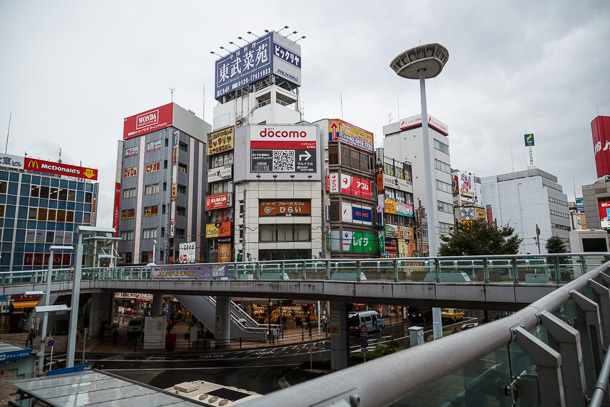 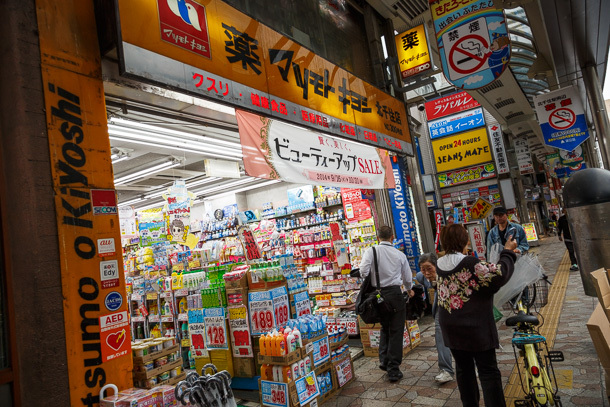 It’s a bit similar to the area around the Nakano Sun Mall Shōtengai in Nakano Ward. 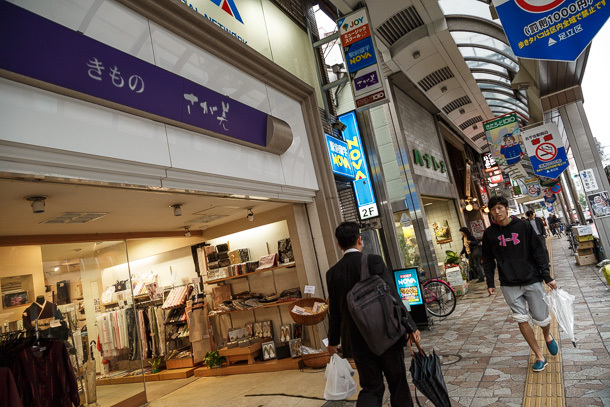 The back streets are quiet during the day, but offer more come evening, when lit up and full of people getting off work. 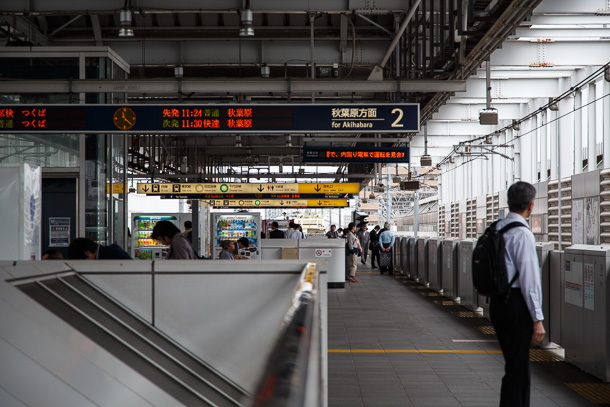 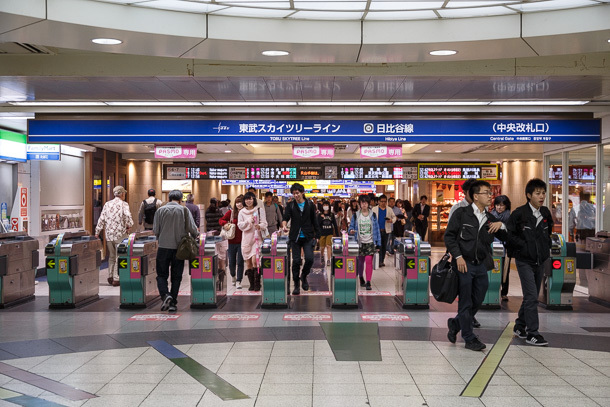 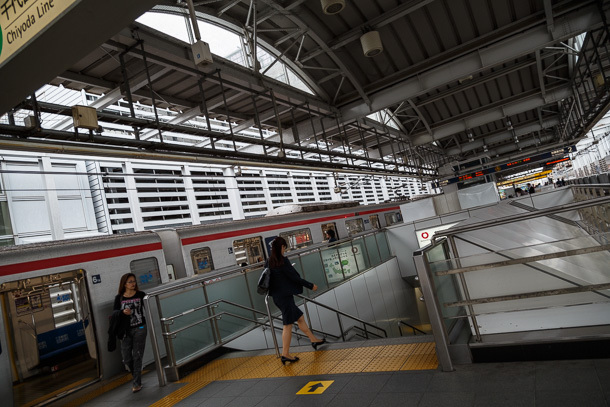 Kitasenju Station is a busy hub with connectivity to many parts of Tokyo, Chiba, Tochigi and Ibaraki via the JR Jōban Line, Tokyo Metro Chiyoda Line, Tokyo Metro Hibiya Line, Tōbu Skytree Line and Tsukuba Express. 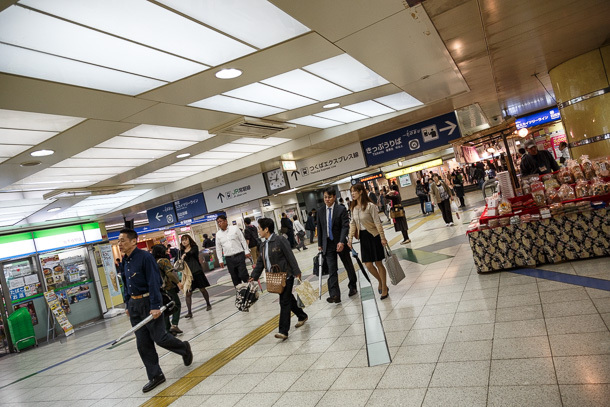 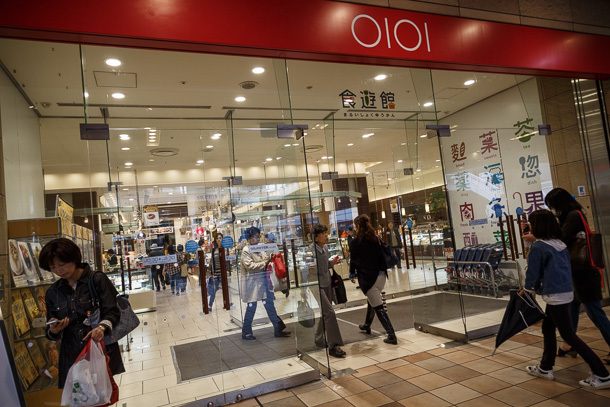 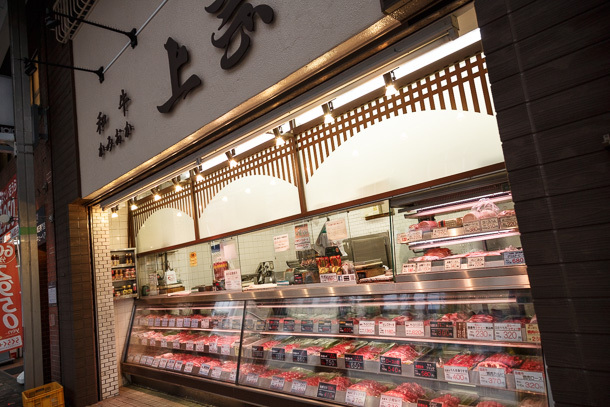 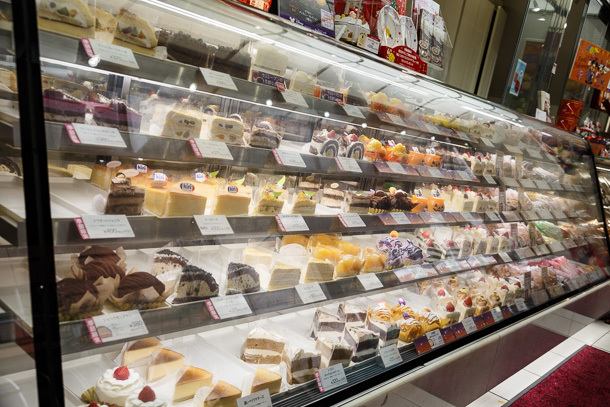 Anchor retail at the station includes branches of Marui and JR East operated Lumine. 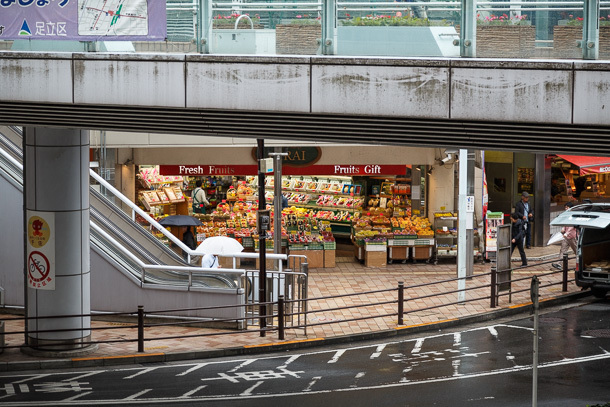 But I have my sights on the streets below and just need a few minutes to figure out how to get there passing under the elevated walkways, rather than on top of them. 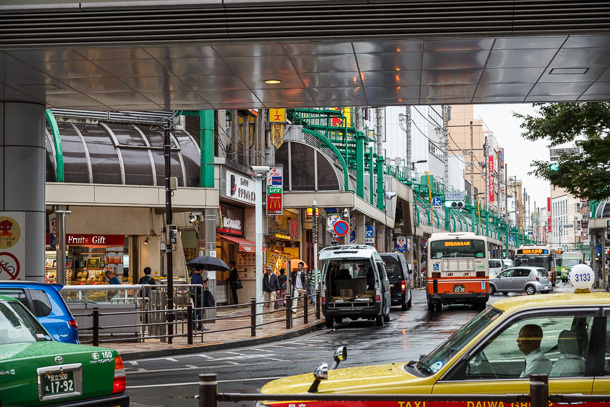 The arterial road leading west from the station is flanked on either side by highly visible green hardware supporting the translucent overhangs of Kita Road 1010 (きたろーど1010)—formally the Kitasenju-eki Nishiguchi Bikan Shōtengai (北千住駅西口美観商店街). 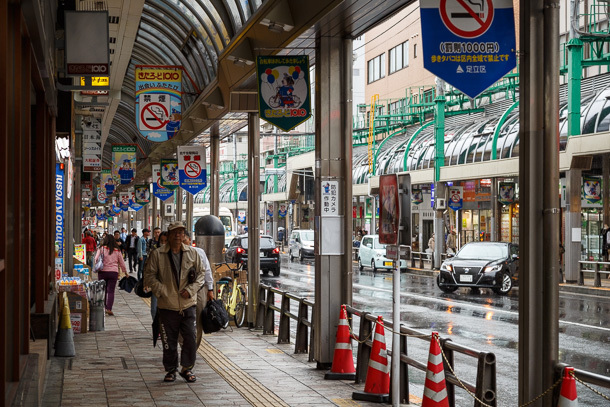 Commercial activity on the west side of the station is denser and busier than the east, and as the backbone through the center of it, Kita Road is a primary focal point and commons for Kitasenju. 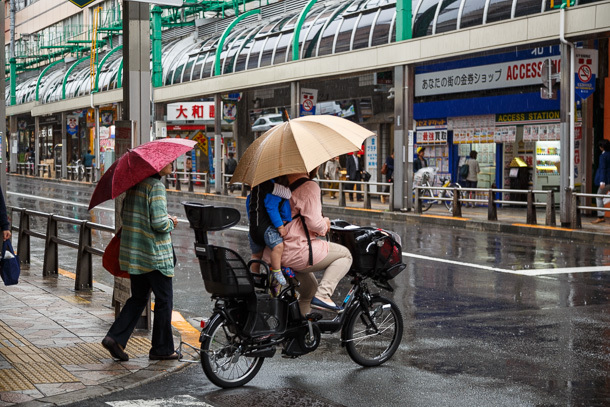 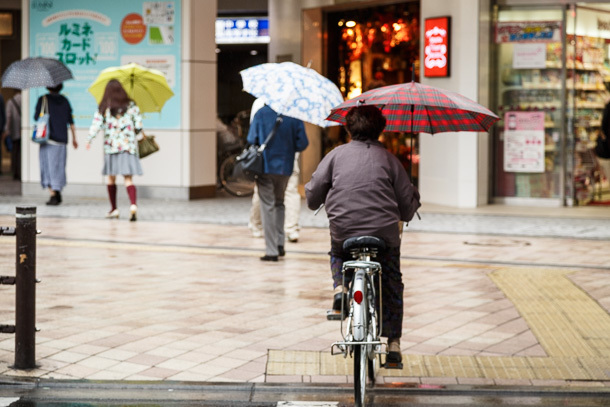 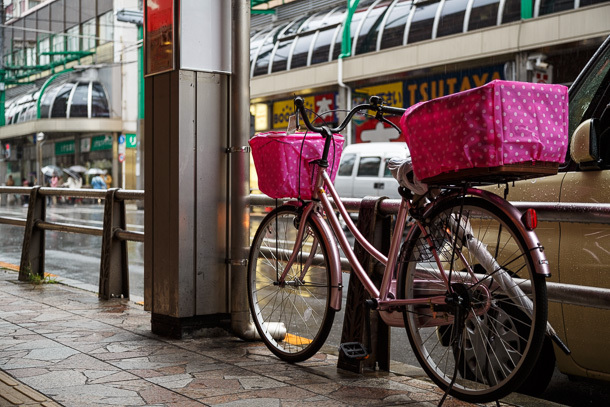 Riding while holding an umbrella, as with riding on the sidewalk and other commonly observed behaviors, is illegal but penalties are rarely enforced. 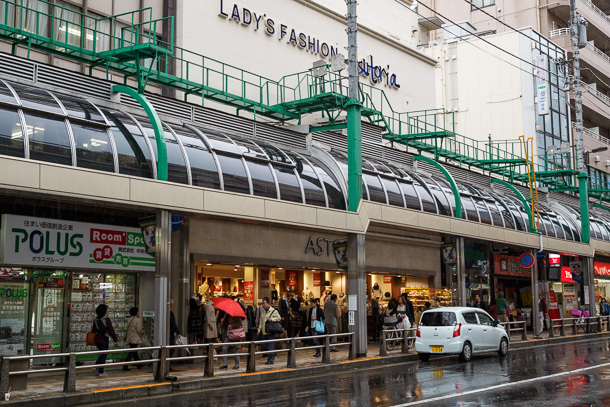 Thanks to the awnings, even with heavy rain open storefronts can continue business as usual. 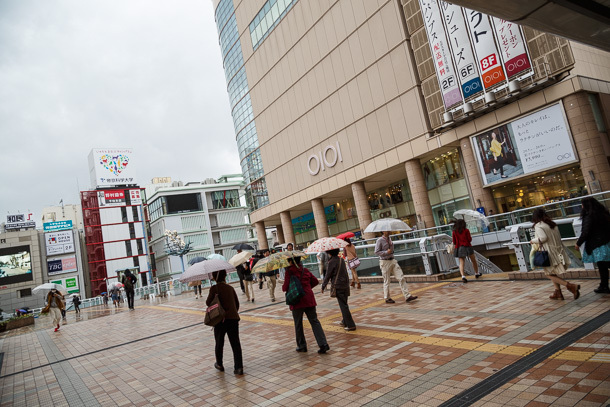 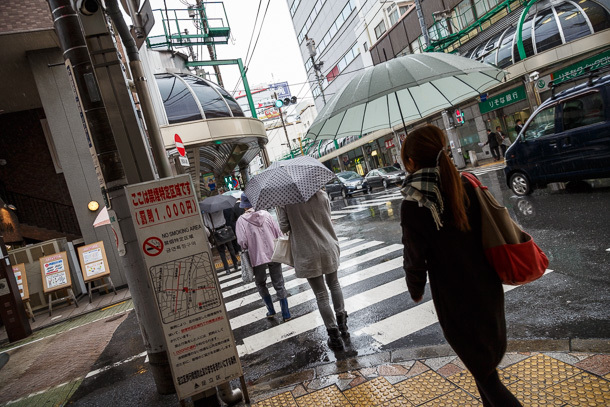 I imagine with clearer weather the shōtengai will be busier, but as wet as it is there are still many people out for late morning walks and errands. 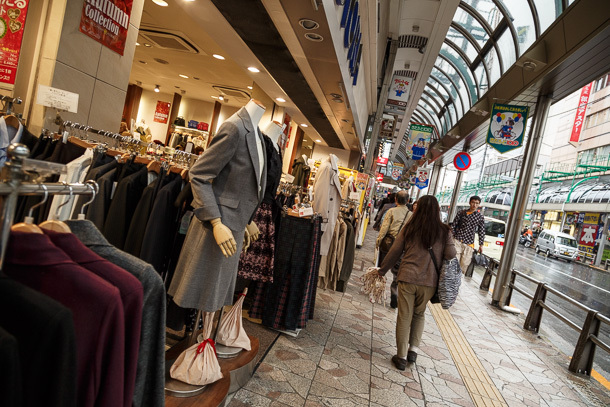 Shukubamachi-dōri Kitasenju Sun Road Shōtengai (宿場町通り 北千住サンロード商店街) runs north from Kita Road. 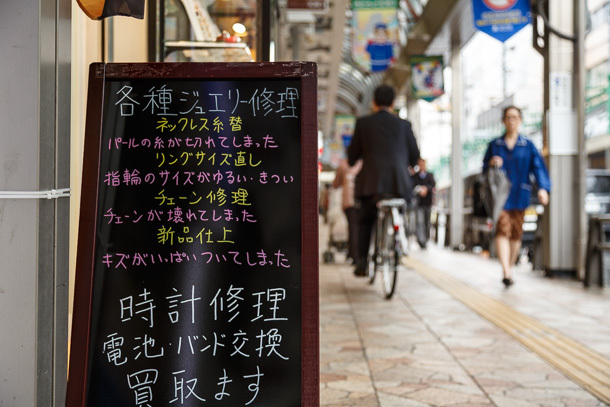 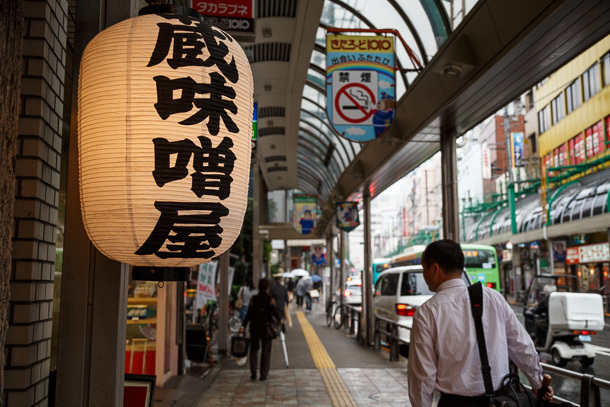 The street name refers to the origin of the area as a post town during the Edo period, the last one on the Nikkō Kaidō (日光街道) before the route end at Nihonbashi. 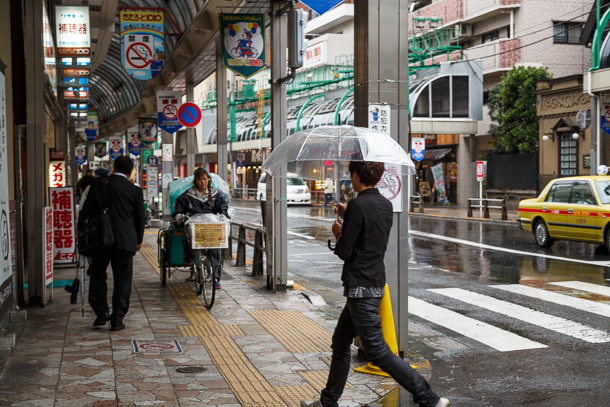 Not pictured behind me is the entrance to the Senju Honchō Shotengai (千住本町商店街) leading in the opposite direction. 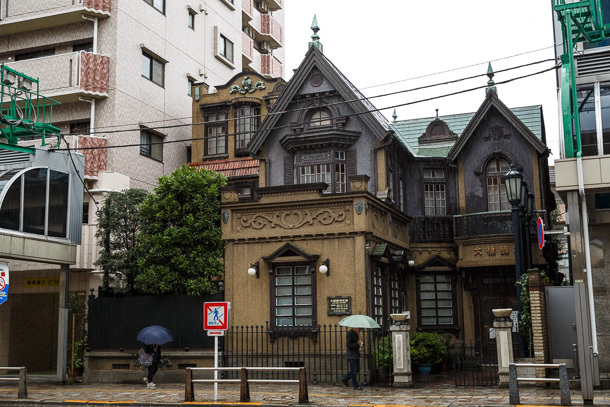 The architecture of the Ōhashi Opthamology Clinic is an unusual sight among its surroundings, but in a place that is a much a mishmash of styles as Tokyo, I tend to think nothing is truly out of place. 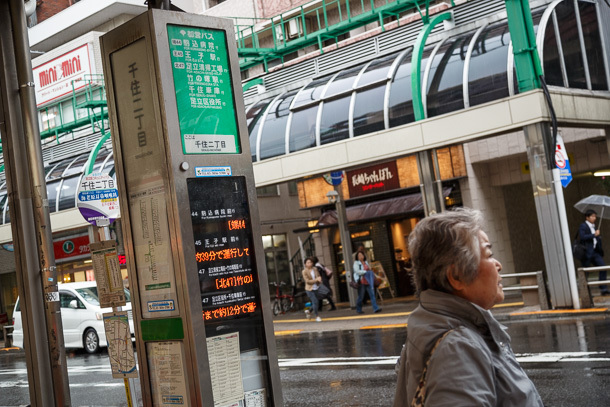 Bus routes that include the rotary at the station also stop along the shōtengai. 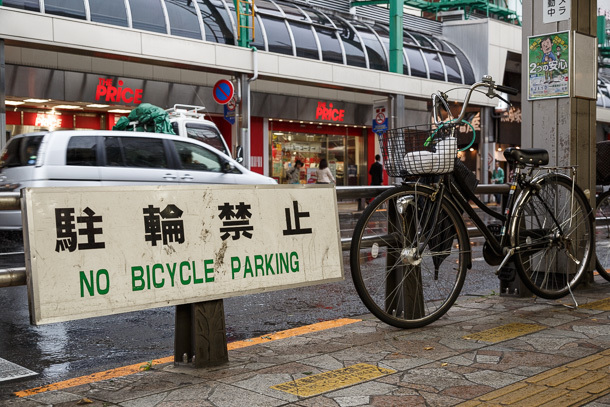 Well, technically it’s not parked in front of the sign itself, so no problem here, yes? 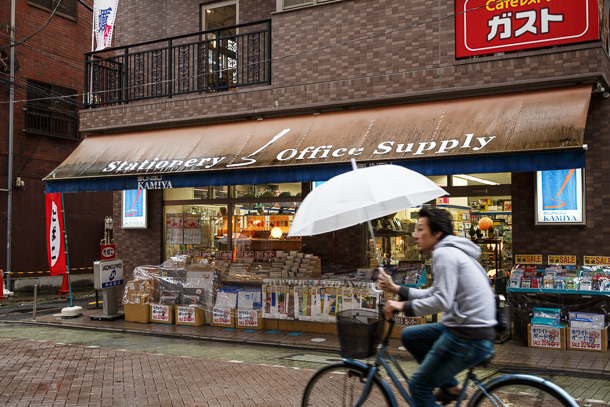 Most businesses along the street are accommodating to bicycle users. 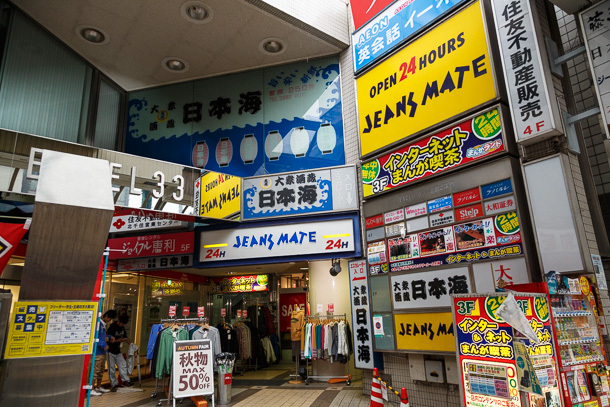 Happy Road Shōtenkai (ハッピーロード商店会) runs north from Kita Road. 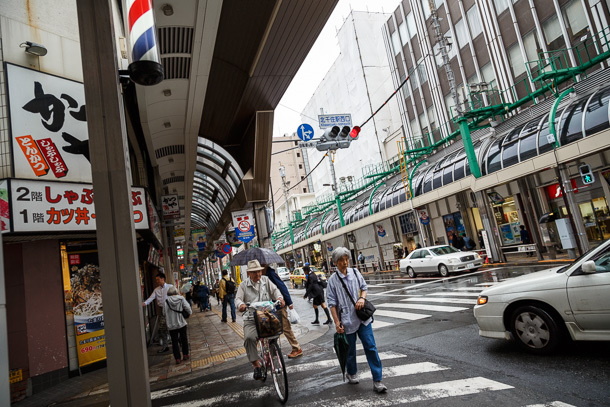 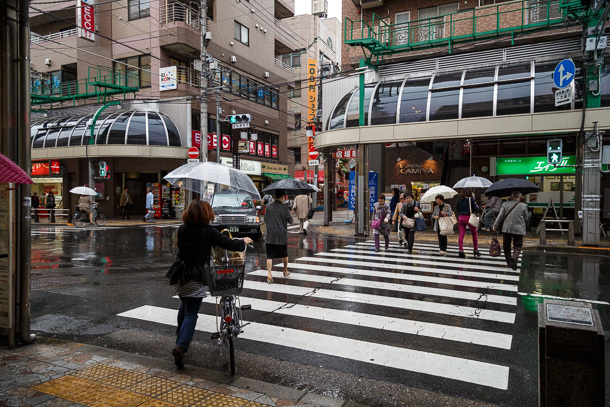 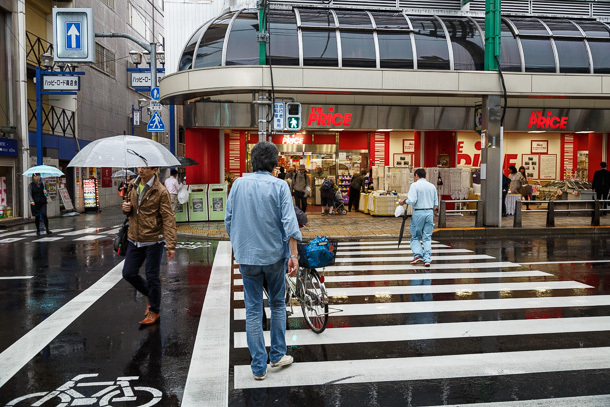 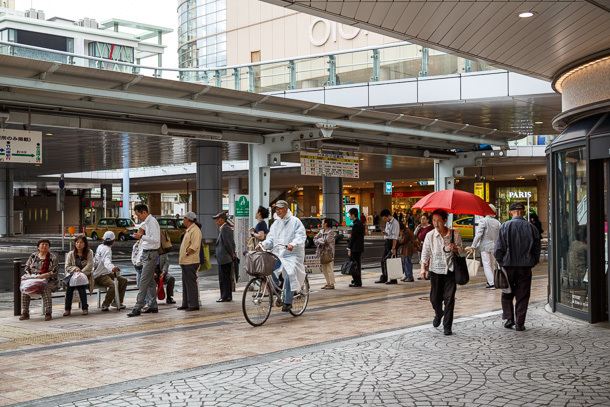 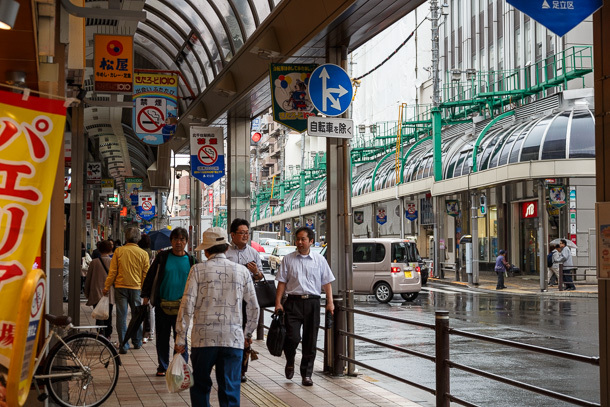 In a pattern that almost looks choreographed, people using the shōtengai extend and lift umbrellas as they leave the awning, then reverse the process once safely on the other side of the street. 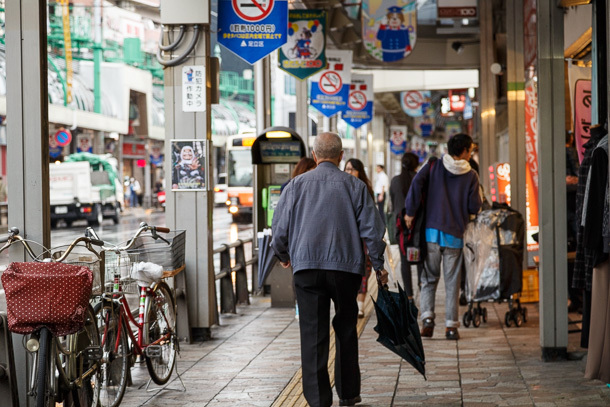 The no smoking zone setup along the main roads and visible signage throughout the shōtengai are welcome. 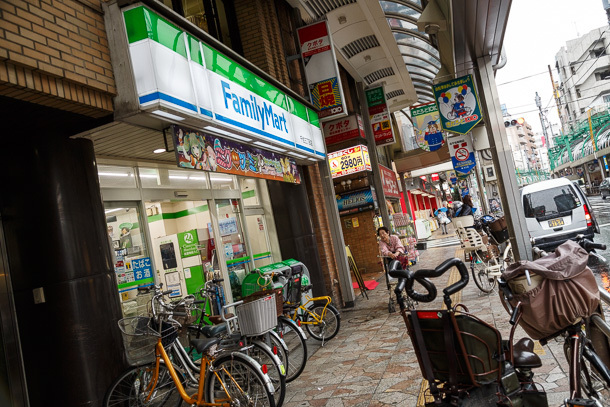 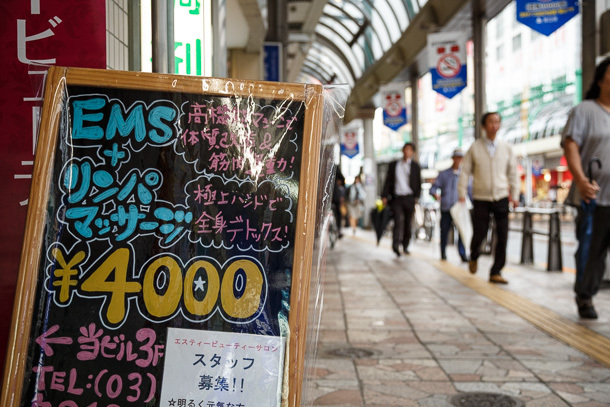 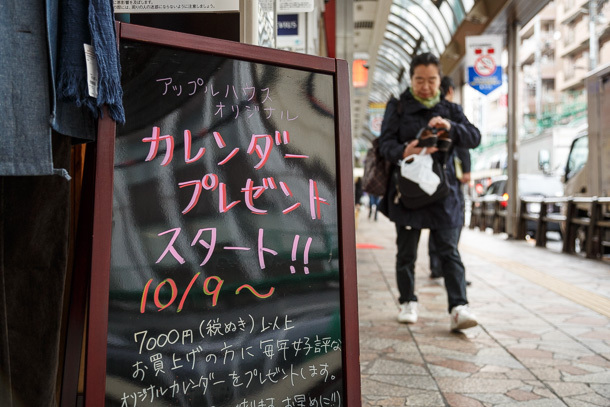 The 1,000 yen fine is entirely too low, considering those for common cycling infractions are 20,000 to 50,000. 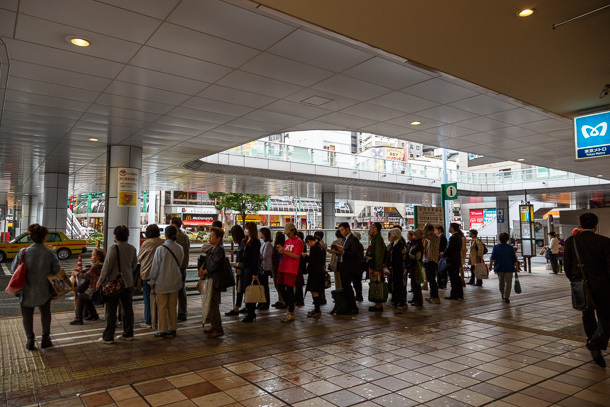 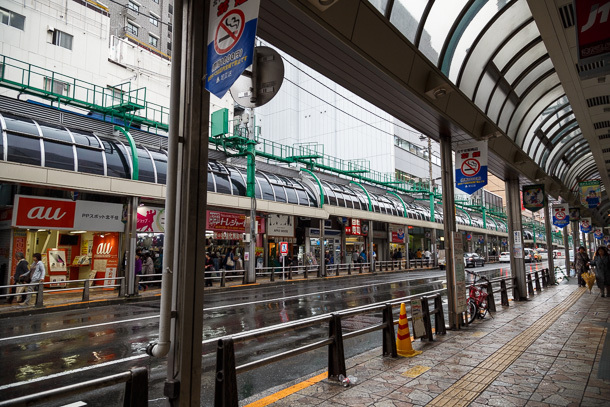 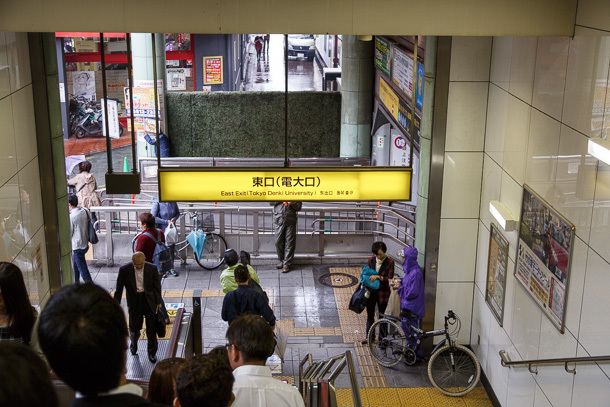 The elevated walkways around Kitasenju Station also function as covered waiting areas for the bus and taxi rotary. 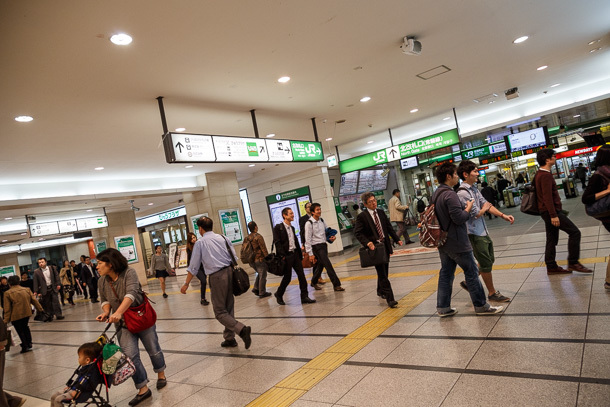 Passing through the station I emerge from the east exit, subnamed Dendai exit after opening of the Senju campus of Tokyo Denki University here in 2012. 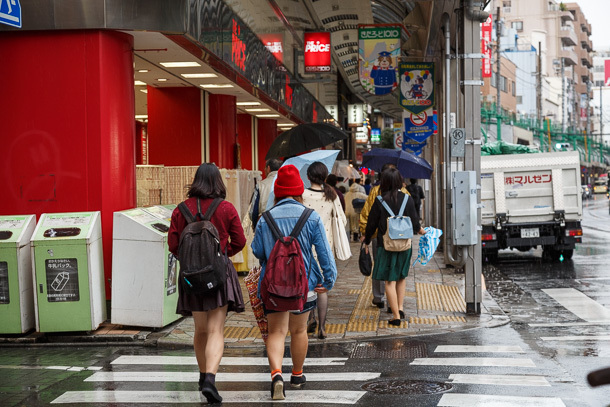 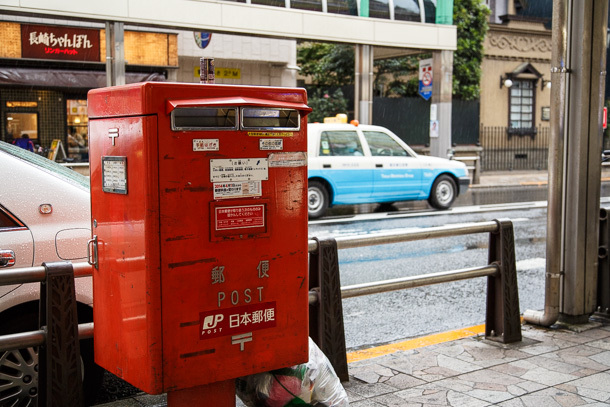 In response to closures of elementary and junior high schools in the 2000s, Adachi Ward has actively courted universities to move to or open satellite campuses in Kitasenju. 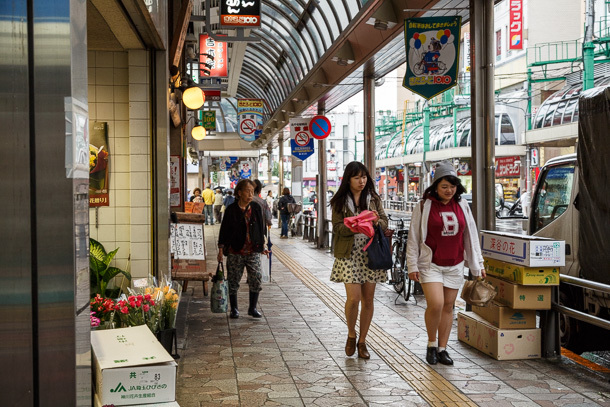 The influx of young residents and cultural institutions has been credited as a positive force in the the area’s revitalization over the past decade. 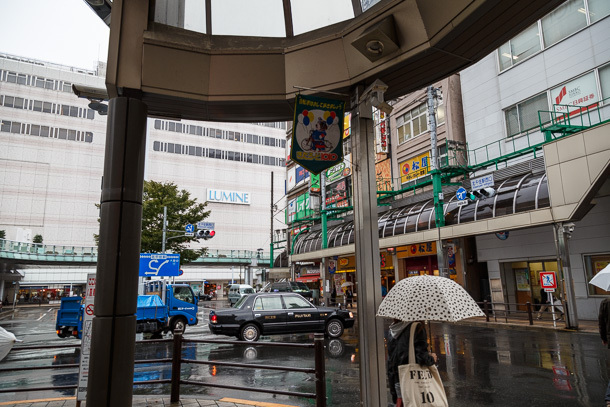 From the overhang outside Denkiguchi I can peer down the Gakuen-dōri Asahichō Shōtengai (学園通り 旭町商店街) with my zoom lens, but this is the extent of my movement for this visit. 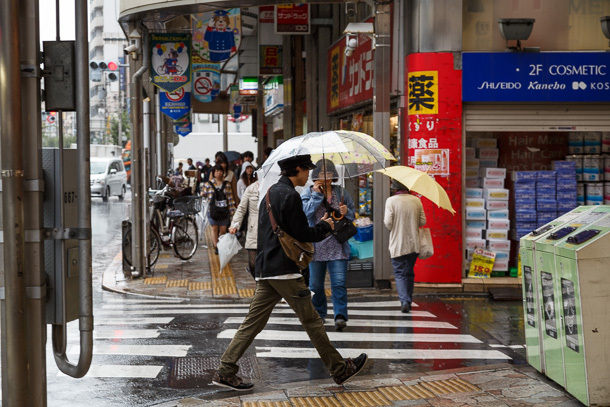 I look forward to coming again for clearer skies and staying late for a few beers.